I had the wonderful opportunity to write up quote as a sub contractor based off of drawings by Mark Willard & Associates LLC. At the time I had never meet or worked with Mark. 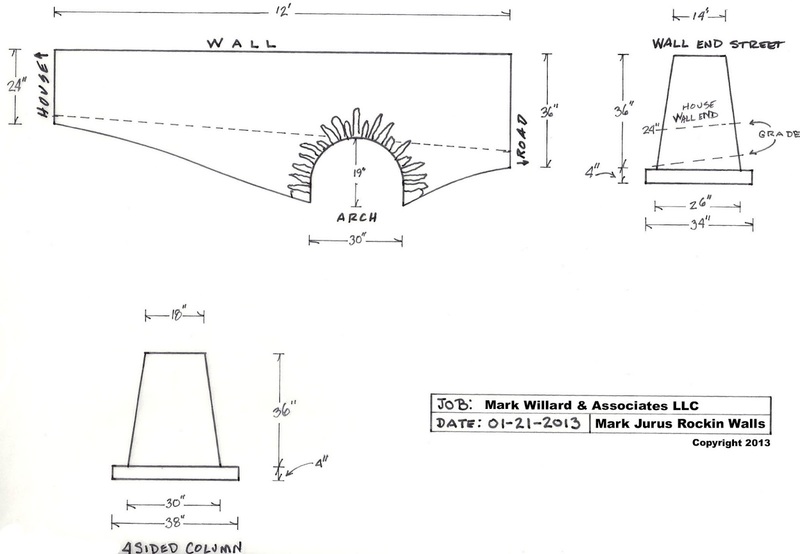 After spending so much time looking over the drawling which included dry stack stone I knew I needed to meet Mark Willard. On September 04, 2011 I sent my first email explaining I had the pleasure to submit $$ on one of his plans. I was on a mission to meet the man behind the curtain. Mark reached out to me February 2012 suggesting he could block off half an hour to meet with me. I jumped at the opportunity. I took the laptop, books.... I couldn't wait to meet someone how was incorporating dry laid stone work in his plans. On February 17, 2012 we meet for the first time at his home office. The meeting went great. My favorite was when he showed me his photo library of images. On the first page 5 of the dry laid stone images were mine. I was starting to believe he might like my work. Even though he had never meet. January 2013 Mark reached out expressing he had a small stone wall project he had in mind for spring. We meet and started our first communications on a joint design he had in his head. The concept was easy. Build a small wall from the road back with a water drain along with a column on the opposite side of the driveway to help connect visually to the wall. 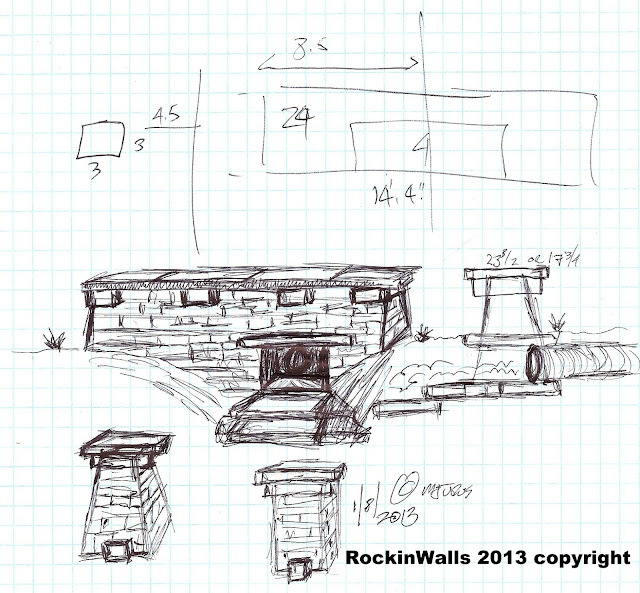 We began with the idea of a lintel as illustrated above with my sketch. 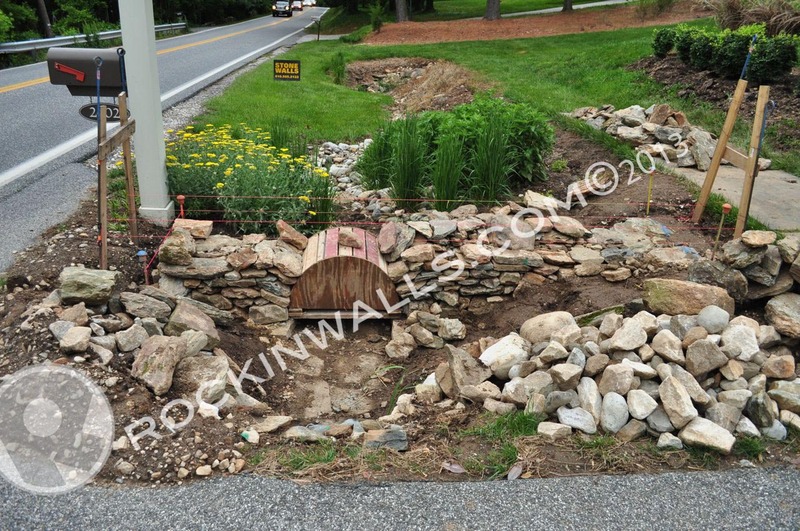 Mark reviewed many of the stone samples such as Butler Maryland stone and Western Maryland stone. 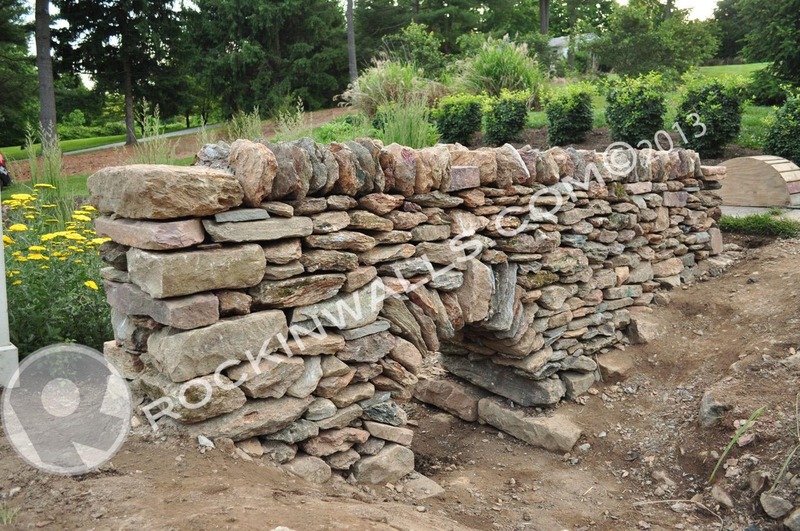 His vision was to have a stone which looked more like what is seen in New England. A field stone allowing the wall to look as if it had been built 100 years ago. The start of a clean pallet. 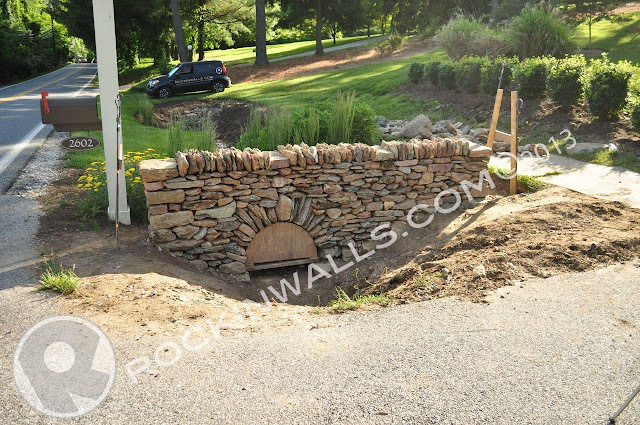 Ready for a stone wall and 4 sided column. Set up. Stall mats placed on grass to protect the lawn. 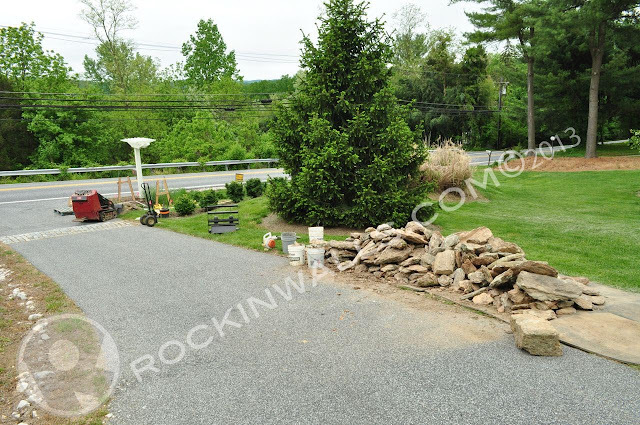 Field stone from my farm gathered and sided dumped up the driveway for staging. Rockin Walls Base Station set up. 1 work trailer with everything for the job start to finish. 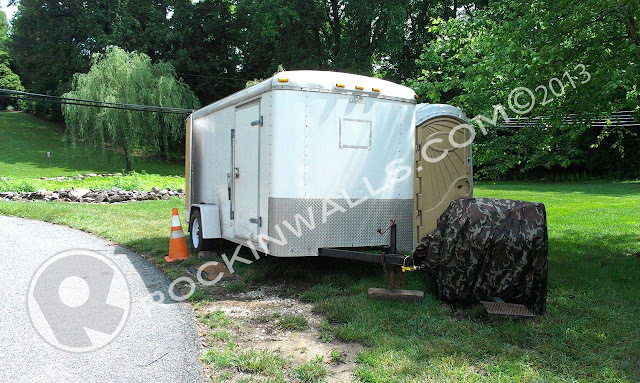 Dingo anchored to frame for security and Porta-Potti hidden around back of trailer. 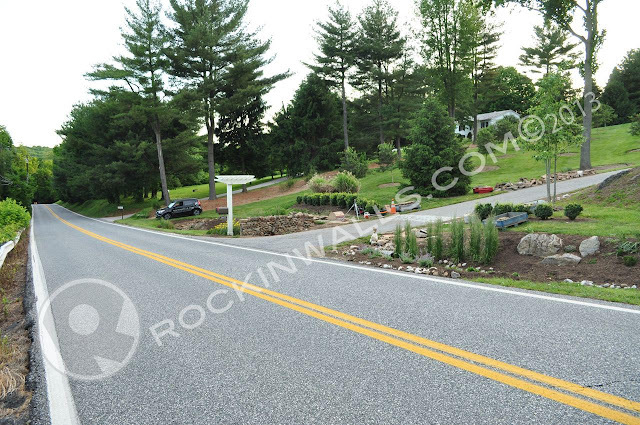 Since this is Mark Willard & Associates home office I try to be considerate of the space not to offend any of his clients as they drove up his driveway. The plan. 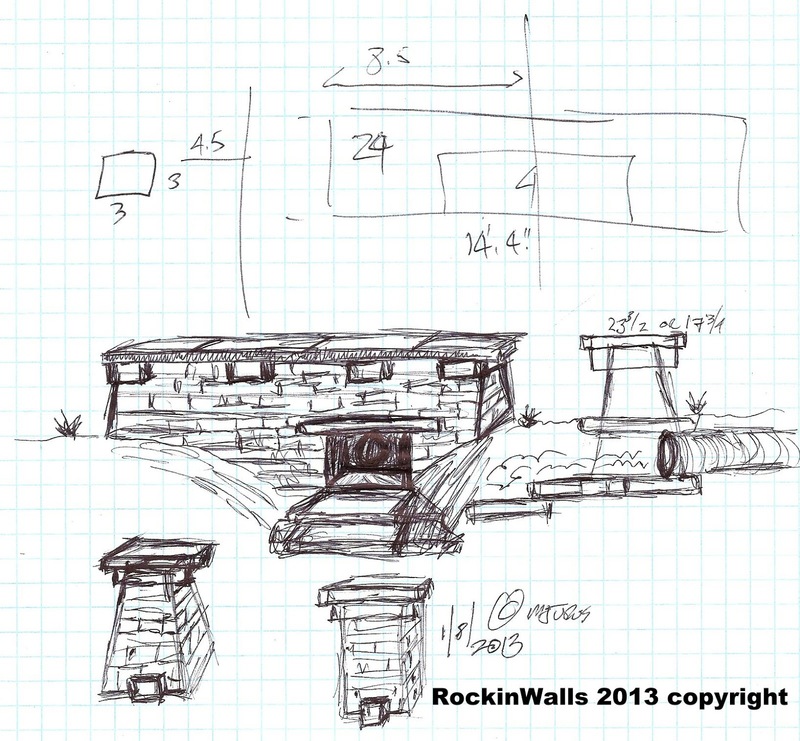 You will notice the original sketch and conversation me and Mark started with was to build a lintel in the wall for the water to flow threw. I suggested changing this in order to build with field stone. The lintel would have required a long stone to bridge the top of the drain. The only solution to this would have been to purchase a PA blue stone tread. 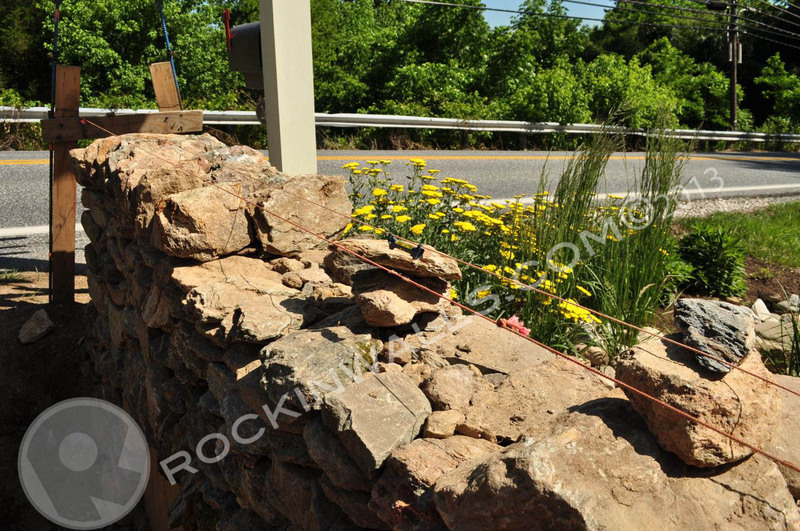 Which would have just made the stone stand out - looking out of place with others. The work involved to build the arch to me requires less time. Mark was 100% on board with my suggestion. 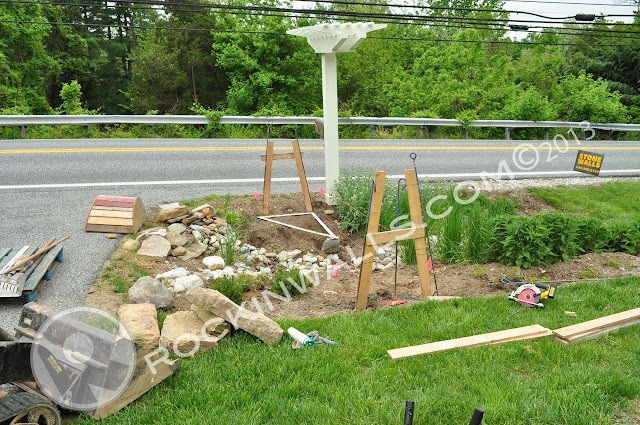 Setting and squaring up the wall frames to the white line on the side of the road. Wall Frames built with a 1:6 batter. 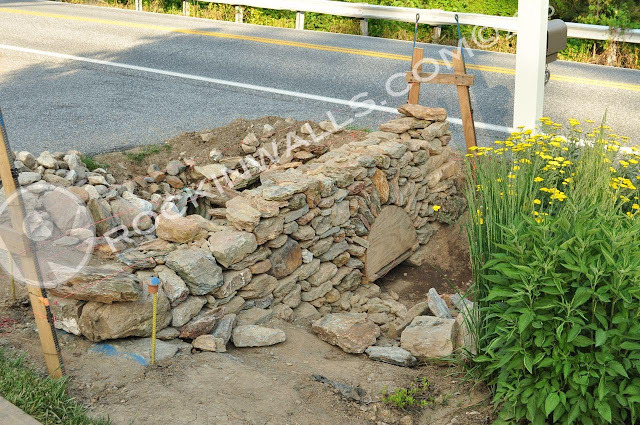 3' high wall on the road side coming back to 2' on the house side. That was level. I don't think I could have gotten any luckier on that calculation. Dig out and removal of all large drainage aggregate - Cockeysville RIP-RAP...along with river jacks Mark had placed in the bed. I dug out the bank in steps to allow the foundation stones be be stepped as I built up. I like to use maker plain to help me see my plan of action. A center line was placed down the middle for the drain pipe run off. This would also mark the center of the archway. String lines were set up on both sides to help me set my arch falsework. Since this is an active run off drain I had to consider how I should place the falsework. I was sure to start with building flat work (setting stones into the earth to create a flat bed) in order for the water to flow over and out of the drain threw the archway. Then I built my stone foundation. With the arch placement I was sure to have longer large stones which acted like a curb. Then I was able to elevate the falsework using small boards to level up side to side and front to back. But also staying between the string likes I set up. This upper picture has the falsework arch moved closer to the front string lines. The back shown below was pulled in away from the string lines - knowing that I will have to simply over hang my stones to keep to my wall shape. 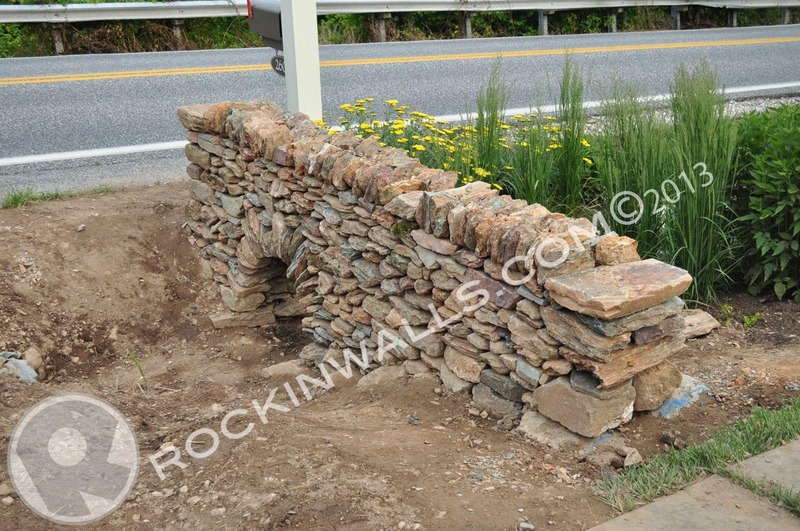 The back of the wall would not be something you will see later-Remember this!!. The other reason this arch falsework looks familiar is that I have re used this from the pervious job. The likely hood of this is not common. Just so happens that the drainage pipe is 15". The falsework arch is 15" h x 30" a perfect solution to the drainage pipe. Front side of wall. This wall didn't take long for me to get into a rhythm with the field stone. 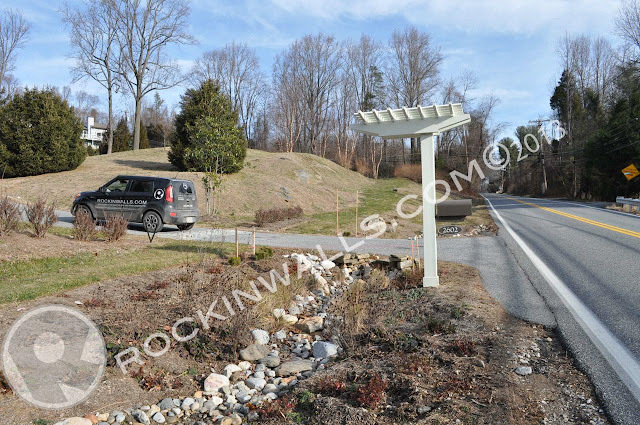 This project came directly after the Round Hill Road Frederick - Arch. 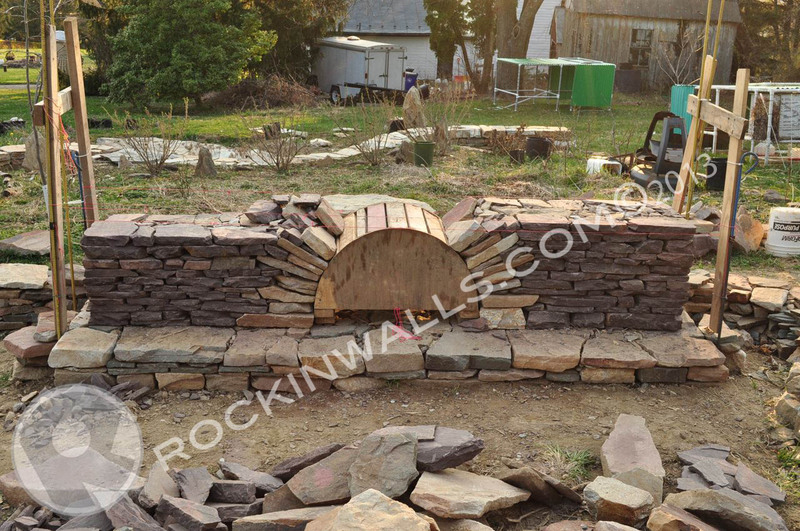 Going from flat bedding stone to field stone to build the arch was a welcome surprise for me which I couldn't wait to confront. 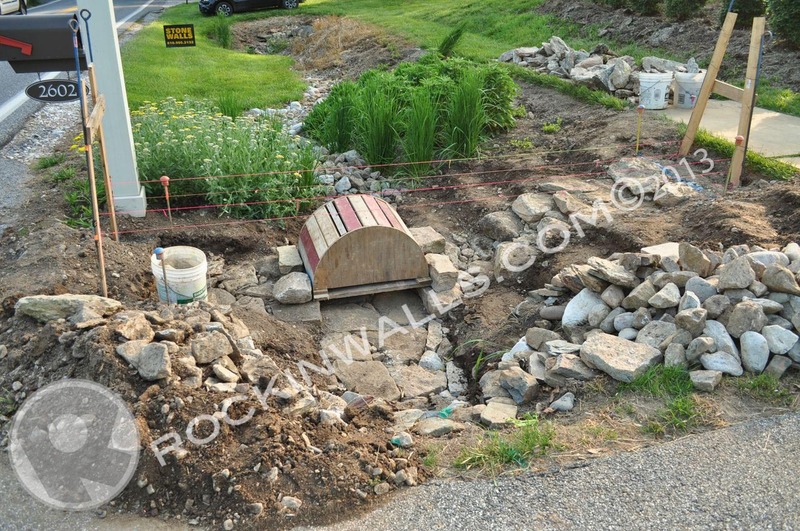 I brought in some old barn foundation stones to help me out with my corners. 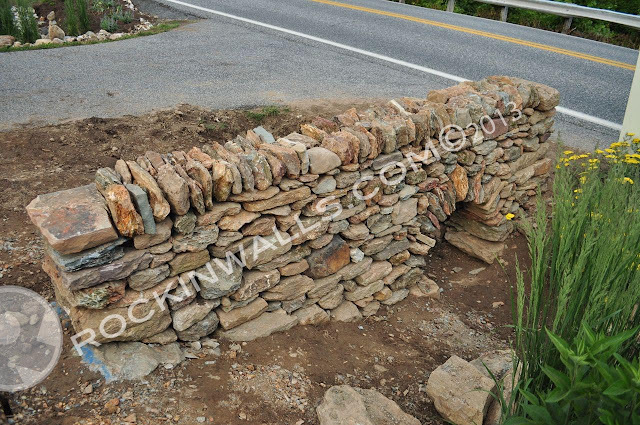 Hard to find nice long 90 degree - corner stones unless they have been reclaimed from a local barn foundation. The board on the frame makes the top of wall from the bottom side of the frame. 3 feet tall on the road side. Working along side this road was no joy. I actually wear my reflective vest and set cones out for safety. Each day I wondered if someone was to busy texting that they my run off the road and hit me. This photos really shows nicely the my work site set up. As you can see again how I used the stall mats to keep the grass from growing between my rocks but also protecting the clients yard from stones dropped from the Toro Dingo's bucket. Straw and grass seed are put down once they mats are removed. This is my hill of stone. I'm not so lucky to have a great deal of 8"-16" stones. Mainly soft balls, or one man boulders. So picking threw these piles can take some time to find what will help me build. 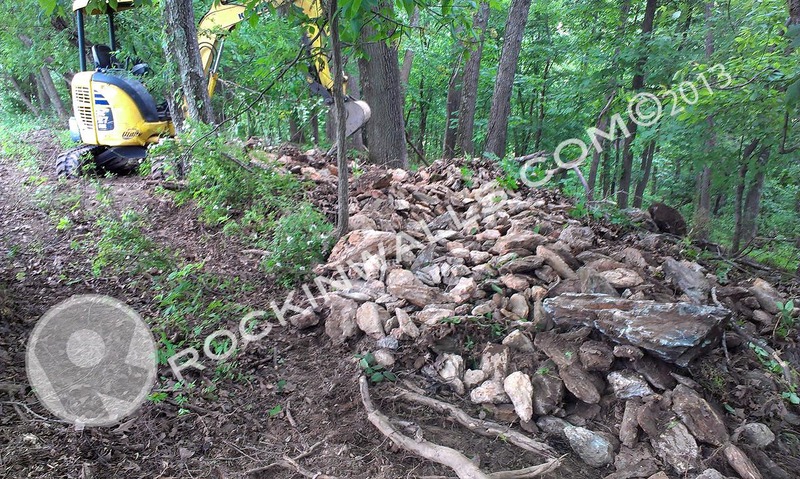 My Komatsu PC 27 mini excavator helps to loosen up the pile along with moving any of the larger boulders to the side with the thumb attachment. 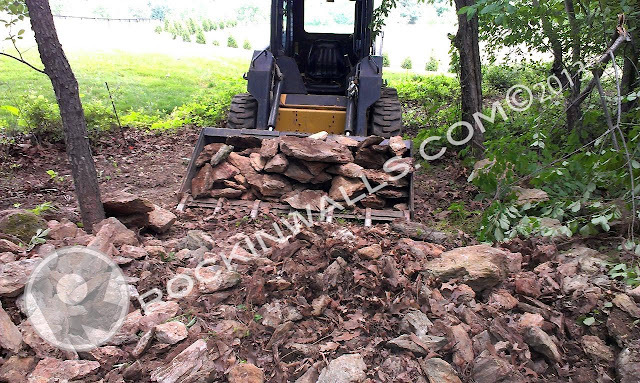 I then use my New Holland 665 skid loader to hand load all the stone to take over to my dump truck on the other side of our farm. Picking stone out of the woods can be a danger if you don't know what you might find under them. The only thing I found was the poison oak on my arm which took a week to heal. That was a real downer. I enjoyed think how this stone as sat untouched from the day it was placed here from someone such as a farmer. 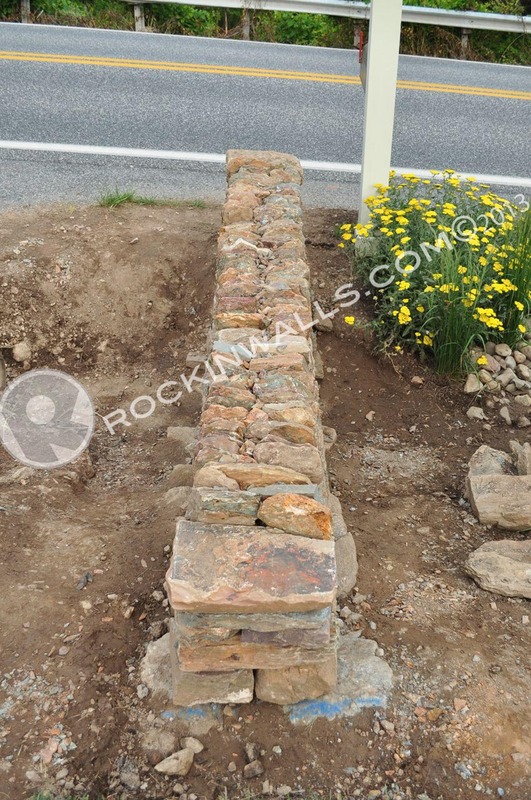 Now only to be moved to a new home and have a beautiful job for many passerbys on there way home from work each day. 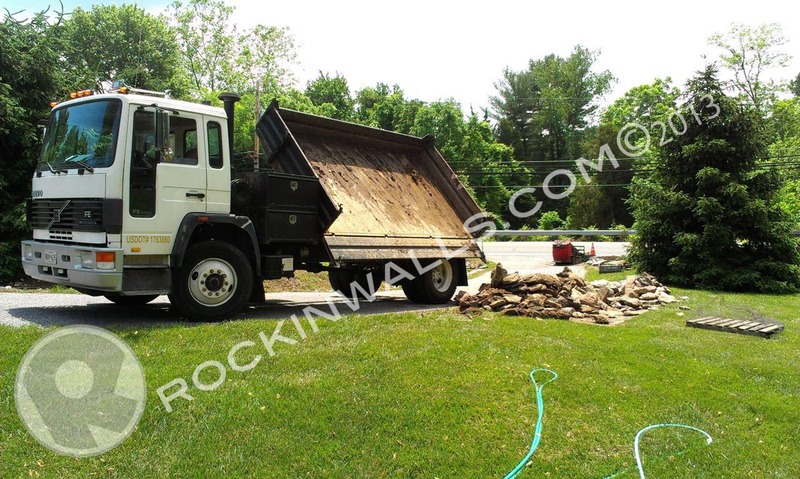 Then my 1992 Volvo FE with a Romanazzi 3 way dump challenging job site keeps the rocks flowing for the next stage in the game with the handy side dump. As long as it doesn't get stuck in the yard. Then the Toro Dingo TX 420 comes in to scoop them (me hand picking) off there feet (sitting on the stall mat) and moving them to there new home - a dry laid stone wall with a function. Now you can appreciate just how much back end work goes into finding field stone and moving it to a job site. No easy task. Yes the time, labor, hauling, equipment... can add up to just as much as a pallet of stone from the local stone yard. As I becoming close to the top of the wall I had to really thing about what to do about the caps. Mark had wanted flat cap stones with little to no over hang. The issue I was running into was SMALL stone and lots of it. Stone will always tells you what it wants to do if you listen. This stone was not large enough to allow for flat cap stones. I meet with Mark to talk about idea's. With the conversation going Mark came up with a wonderful solution on the spot. As seen above. So the next day while he was meeting with a client on the job site. I went to town building. See safety orange. I don't want to be mistaken for an ornamental grass with all those fast drivers coming down the road. I'm placing 8" vertical cap stones with larger flat stone set on the top of the wall called chicks & hens. I use a string line set level with a line level as seen in image. 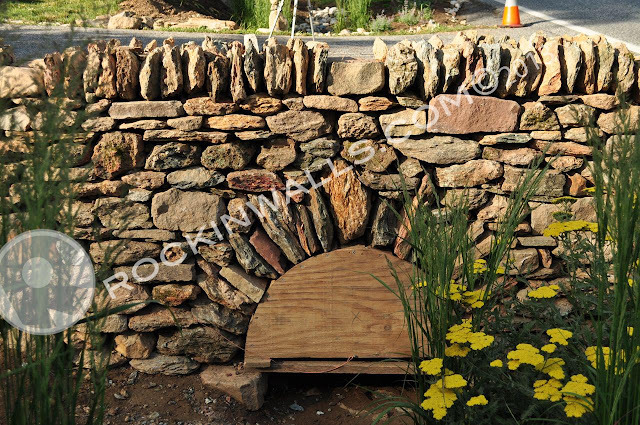 This keeps everything even at the top of the wall as I fit and shape the stones to the needed sizes. All finished up just have to remove the falsework. Mark and his partner were available to watch the final moment as I removed falsework from the all to see the new dry laid stone arch. 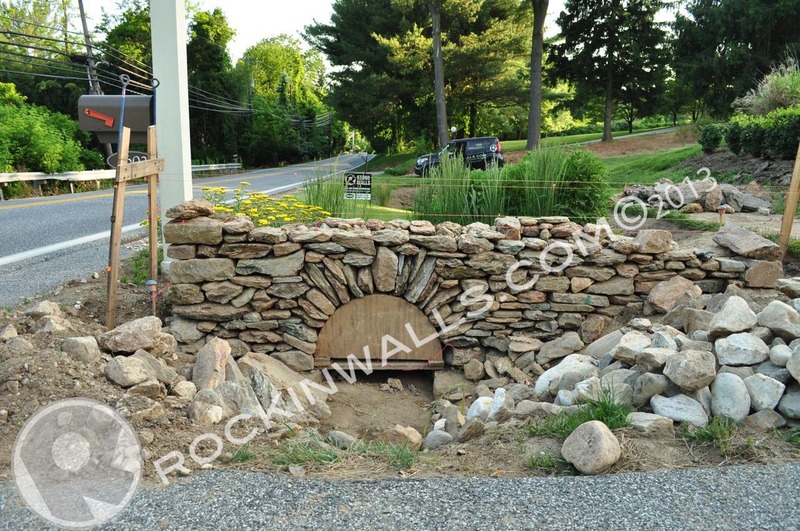 Many people look an dry laid stone arch wondering how this could really be structurally sound? I like to say crazy glue is amazing stuff....ha ha ha....Mark had the same thoughts I'm sure until I offered to walk on top of the wall. After I did so - the look on his face changed to sense of true confidence that this wasn't going to fall down any time soon. I did ask him if he wanted to walk on it before I did, but he did decline. The back side of arch which will be filled in and act as a retaining wall. 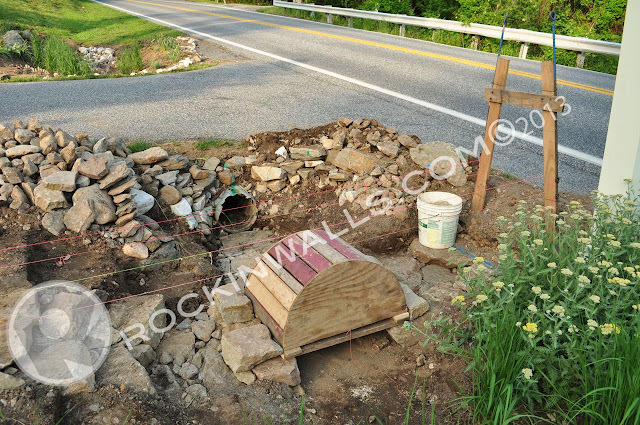 This will allow the wall to be connected to the driveway. 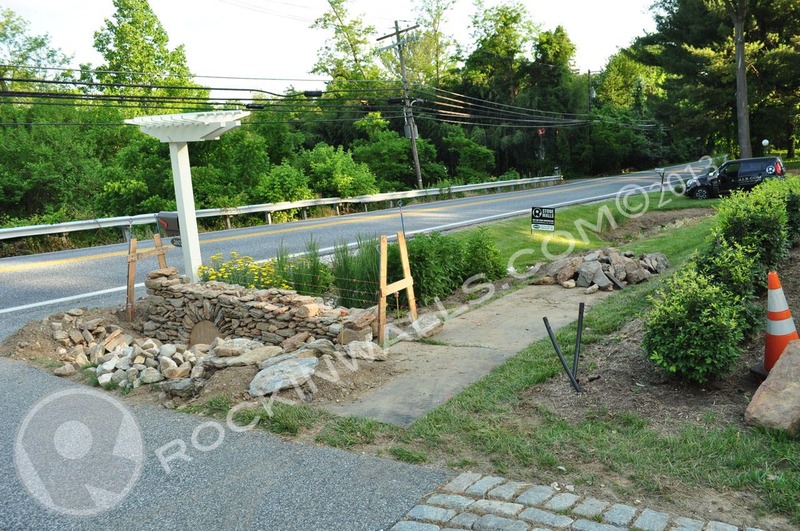 A berm of sod will help keep the water flow heading out into the road. 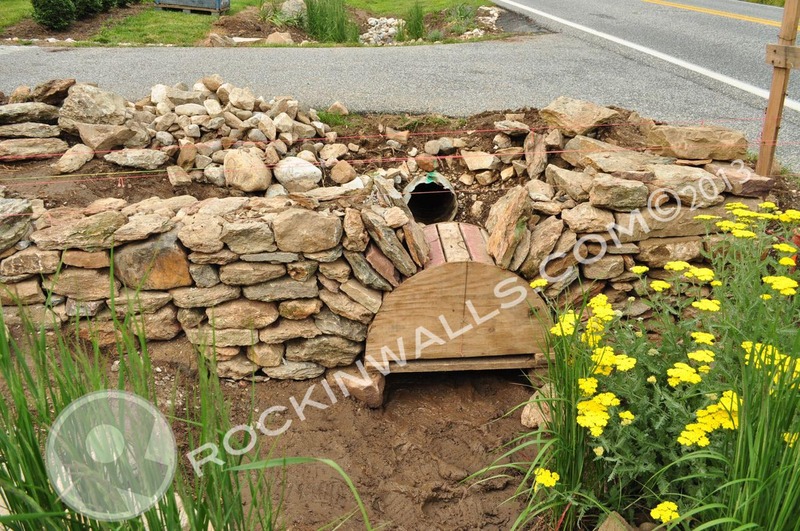 A drain pipe was installed to contact from the driveway pipe to the face of the wall. Just a friendly reminder. Now you see it later you won't!! Blog to follow. 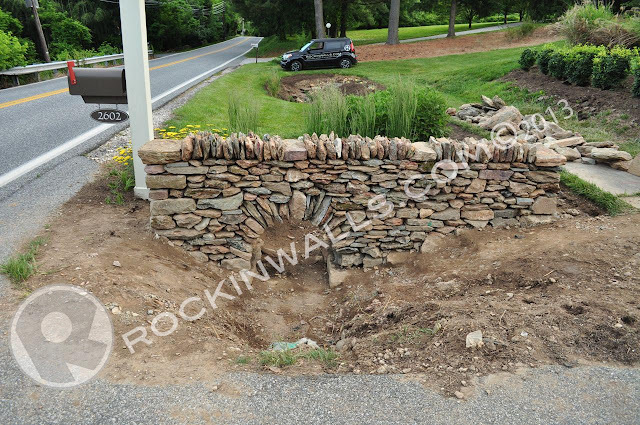 Top view of wall from house side looking at road. Double sided 8" vertical stones with 4 large flat cap stones. I really enjoyed all the people who honked each day or yelled out how nice it looked as they headed home from work each day. I'm sure all the landscape guys from the trade wondered what I was going to do with a pile of stone which no one works with. 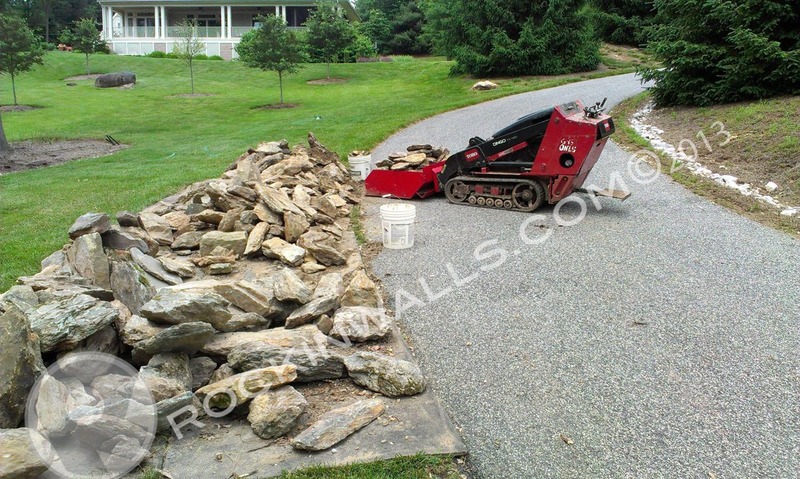 No one uses field stone in our area since it is not so common. The only choice they have are to buy palleted stone. 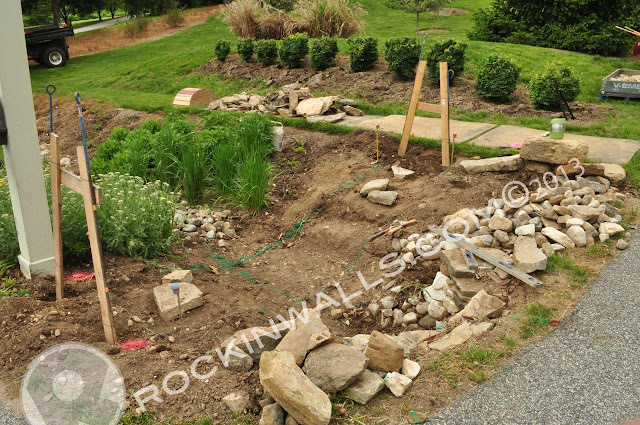 One of the local landscape company designers had stopped one day to see what I was doing. (of which I had attempted to relay my desire to meet with when I spoke with him on the phone a month earlier). He suggested I bring my resume and photo's to drop off for him to see. I had to scratch my head and wonder what the heck he was saying???? Or better yet why I'm I wasting my time.... I just had to point out that I wasn't looking for a job - I just wanted to share my knowledge of the craft. I think he was wondering what the catch was the hole time - clearly those who read my blog know this = no catch. Just good old stone stories. Thank you Mark and Russ for giving me this opportunity to be apart of this amazing wall project. I feel extremely honored knowing you chose me for this project when you have countless connections. It was a pleasure working with you too! Mark, impressive work you do. I've been to your website a few times over the years now and never managed to find time to drop a compliment, shame on me. 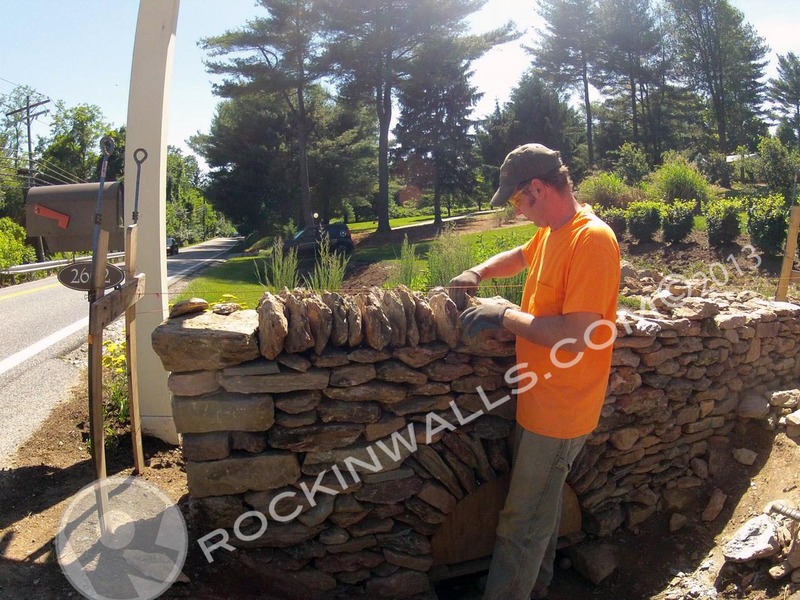 I play with stone too and always forget that us dry stackers can do columns too. Never tried one myself, looking forward to seeing a write up on it!